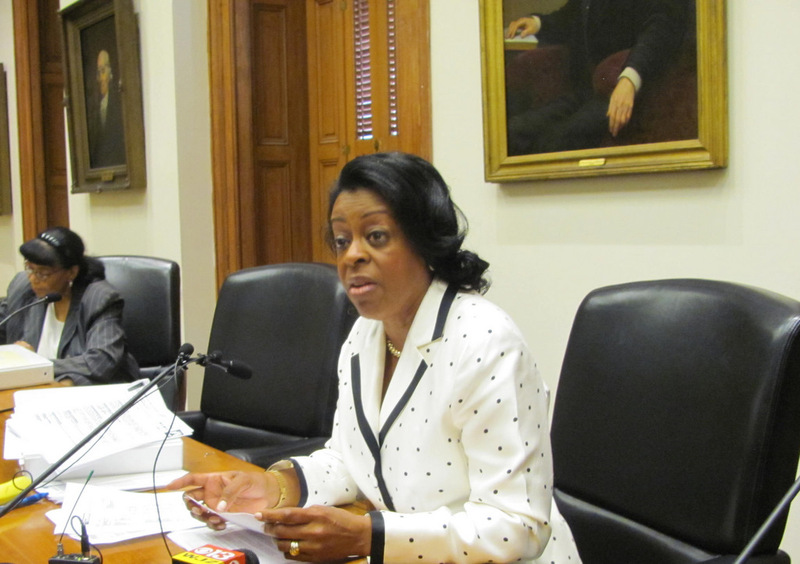 Above: Comptroller Joan Pratt at a Board of Estimates meeting in 2014. The Board of Estimates today awarded $599,000 to three companies to audit city agencies over the objections of Comptroller Joan M. Pratt. Pratt voted “no” four times against the contracts, which were otherwise approved by the five-member board. Pratt did not explain her objections, but has argued in the past that the Audits Department, which is under her authority, should be responsible for financial reviews of municipal agencies, even though the department has not conducted a full agency audit (with one exception) during her 20 years as comptroller. Pratt’s attempts to secure about $2 million for additional audit staff have been rebuffed by Mayor Stephanie Rawlings-Blake. The 2012 charter amendment allows agency directors to decide whether they want their financial records checked by one of three commercial companies selected by the administration or by Pratt’s audits department. So far, none of the voter-mandated audits has been finished, even though three audits were promised by September 3. Following a Brew story about the audit delays, the administration announced that the Transportation and Recreation and Parks audits will be completed by November 30, and the Finance audit by December 31. Last week, Finance Director Henry J. Raymond cited a litany of problems – including understaffing and the Baltimore riot of last April – as reasons for the audit delays. • Fire Department is to be audited by SB & Company for a fee of $203,380. • Department of Housing and Community Development is to be audited by Hamilton Enterprises for $134,692. • General Services Department is to be audited by SB & Company for $131,360. • Mayor’s Office of Information Technology (MOIT) is to be audited by CliftonLarsonAllen for $129,690. The contracts require both financial and performance audits of the agencies. In addition, the city has outstanding a contract with CliftonLarsonAllen to review the books at the Baltimore Police Department. In a hearing last week before a City Council committee, Raymond said the second round of audits are projected to be finished early next year, followed by audits of Planning, Law, Human Resources and the Baltimore Development Corporation starting in May 2016. Raymond pledged to meet the charter amendment that calls for the audits to be finished by the end of Mayor Rawlings-Blake’s term in December 2016. Today Raymond took the place of the mayor, who was absent from the BOE meeting, and approved the audit expenditures along with City Council President Bernard C. “Jack” Young, City Solicitor George Nilson and Public Works Director Rudolph Chow.